Wēpa offers a cloud print solution that eliminates the need for servers on your campus and fits easily into a student’s daily life and technology habits. Documents can be uploaded in a number of convenient, easy-to-use methods from campus and personal computers, tablets and smartphones. With 7 easy upload methods available, we guarantee there is one to fit everyone’s personal preference! Fast, easy printing from any Windows or Mac application. With our Traditional upload feature, you can print from any Windows or Mac application that allows printing. There are no concerns about uploading various file types. Simply download Wēpa to your local machine and print away. We will send you a link to apply Wēpa to your local campus computers. Installing on your public use computers creates a hassle-free guest printing solution. Users can also download Wēpa to their personal computers by logging into their Wēpa account. Open your document, choose "file>print" and select your preferred Wēpa printer. Upload documents from any web browser, on any computer. After logging in with your credentials or creating an account, you can upload documents from your computer or connected network directly to your user account. You can control settings and document print requirements before upload with easy to navigate controls. With life’s busy pace, you may not always be seated at a desktop to get things done. With this in mind we have given you the freedom to print from any Apple® or Android® device. You can download the “Wēpa Print” app and begin printing to our cloud. Additionally, our mobile app also has the ability to scan and print documents. Download the "Wēpa Print" app and follow the instructions. Print from any device that can send email. Our email to print system is ideal for students or guests. No account is needed, just email the document and use the Wēpa Code in the reply at any Wēpa print station. If you have an account with us, just send an email to print@wepanow.com with your user account email address and you will find your document(s) in your documents list. Attach your document to an email, send to print@wepanow.com and use the provided Wēpa Code to print your document at any Wēpa print station. Wēpa's Cloud Storage feature allows users to print from their current file storage providers (Box, Dropbox, Google Drive, Office 365 or OneDrive) by accessing it right at the print station. This will allow you to access any file you want to print like it’s being stored right on the print station! No more fumbling for the USB Drive or forgetting to send a file to print ahead of time. As hectic as life can be, printing sure doesn’t need to be a stressor. We want to make our solution so easy that someone can do it before their morning cup of joe! Access your Box, Dropbox, Google Drive, Office 365 or OneDrive account at any Wēpa print station to print your files. 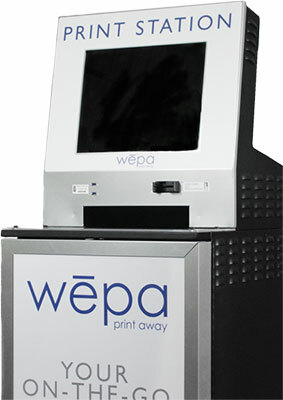 Print directly at any of our Wēpa print stations without a computer or account. Great for guests – just insert your drive and select documents. Access your Canvas, D2L, Moodle, Blackboard Learn or Sakai files at any Wēpa print station to print your files.